Sign Bracket Store offers the classic aluminum post and panel sign, a design that has transcended the test of time. Featuring all aluminum components, and powder-coated for lasting rust and corrosion resistant beauty. This is component system creates a complete post and panel sign and can be modified to your exacting specifications. When you receive the post and panel sign, you simply add the graphics to the powder-coated sign blank. The sign blank for the aluminum post and panel sign has mounting tabs or ears that drop into custom slots in the posts, no tools or hardware needed! Our aluminum post and panel signs can be seen in parks, doctor and lawyers offices, industrial areas, historical districts, in front of businesses, and in upscale housing developments. Aluminum post and panel signs are especially effective for way-finding, and add an appealing and distinctive level of sophistication to your business or city. Aluminum post and panel signs are an effective and surprisingly easy way to create an exceptional signage package at a relatively low price. Timeless and classic in design, our post and panel signs are fabricated in aluminum and powder-coated for a resilient lasting beauty. Composed of components, our aluminum post and panel system can be as unique as you or your business. The aluminum sign blank for the post and panel sign is also powder-coated, and has mounting tabs or ears that drop into matching slots in either a smooth or fluted post. No need for unsightly bolts or braces, making a very clean and crisp sign presentation, all that is needed are your beautiful graphics on the aluminum post and panel sign to complete the package. Installation is quite simple as well. The posts for the aluminum post and panel signs are available in a smooth finish, or in a fluted design, and are typically dug into the ground approximately 30 inches (check with your local ordinances) and can be secured with cement for a permanent installation. Cast aluminum sign bases can be included as well, adding a touch of elegance and charm to the aluminum post and panel sign. The sign blank is then installed after the graphics are added with the ears or mounting tabs into the posts. The final touch finials are then placed on the top of the posts to finish it off and give it a professional look. 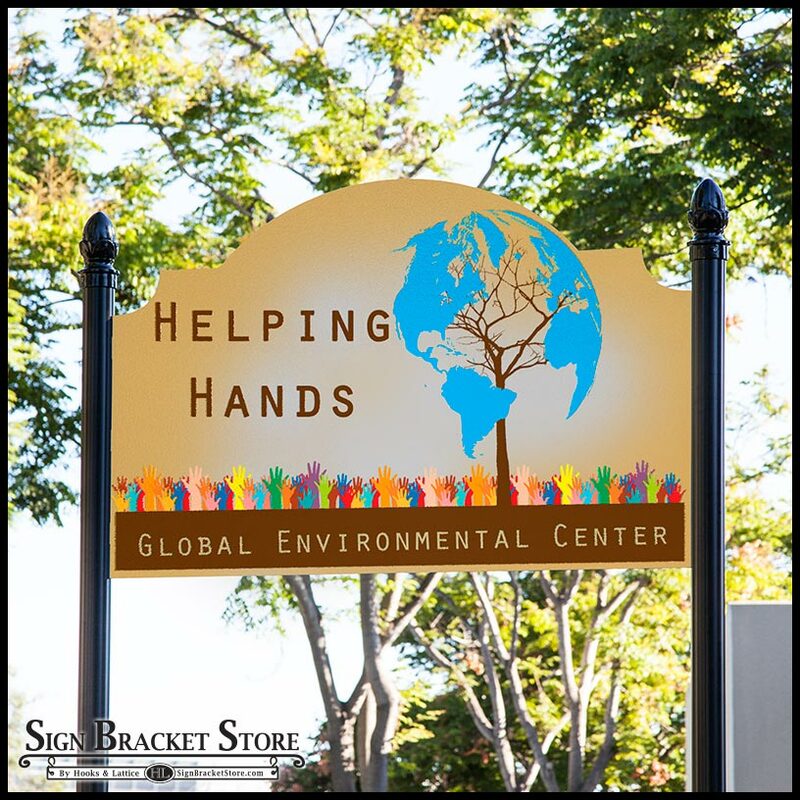 Sign Bracket Stores aluminum post and panel signs can be seen in parks, doctor and lawyers offices, industrial areas, historical districts, in front of businesses, and in upscale housing developments.